As I continue to work on my Chrome Extension for importing invoices to FreeAgent, I’ve finally gotten to the point where I can parse the invoice, extracting the necessary information automatically. 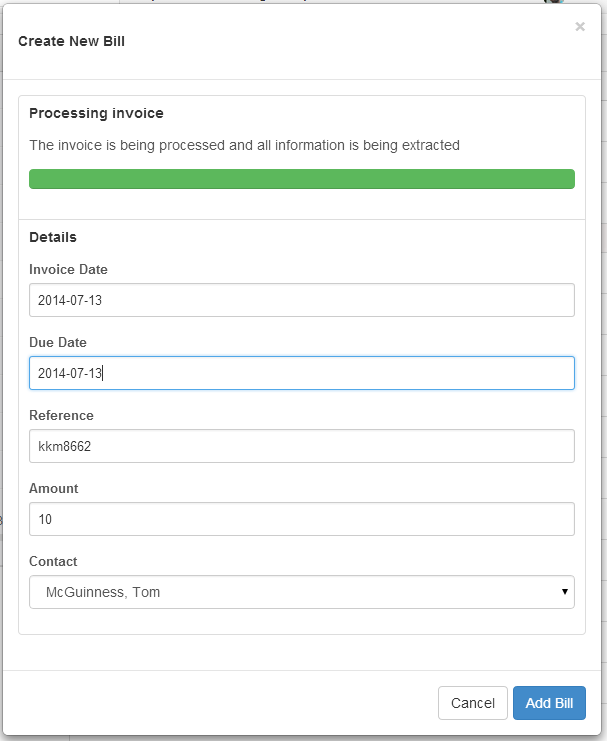 It’s now just a matter of clicking the “Add to Bills” button beside the invoice you want to add and the extension (with some Azure backend support) parses the invoice, extracting the relevant information. You can also select the contact that this bill has come from and I’ll be adding the FreeAgent category support very soon. At present, Github is the only invoice I can parse, so once I’ve got that working well, I’ll expand the scope of the parser to handle Azure and other major SaaS providers. I’m looking for beta testers at the moment, so if you’re interested, please let me know. I typed it incorrectly. The saas ic clio and the site I log into is http://www.goclio.eu. I found out late yesterday that clio has just connected up this week with zapier which should apparently allow connections then through to Freeagent. I tried to connect them together but found out they haven’t yet implemented the connection for those logging in to clio on a .eu or .uk clio website. It appears there will be a connection through zapier for firms using clio from outside the USA in the future. Thanks for that Kevin. Zapier is a great product, but I found it lacking when it comes to things like invoices. I had a look at their support and they only cover one or two aspects of Clio and invoices don’t appear to be amongst them. I’m going to put together a short video of what Invoice Porter can do and if you think it’s something that might be useful, I can look at extending it to support Clio. That would be great. Really appreciate it.